Happy 46th anniversary! The article which birthed the Highgate Vampire legend: “Does a Wampyr Walk in Highgate?” Hampstead & Highgate Express, Feb. 27, 1970, 1. Source: Camden Archive/Sam Perrin. Forty-six years ago, the Hampstead & Highgate Express asked “Does a Wampyr Walk in Highgate?” on its front page. Today, we seek to answer that question by asking to hear from two of its alleged victims. Vamped and the administrator of thehighgatevampire.co.uk, Trystan Swale, issued a joint press release on Feb. 6, 2016 “asking for the public’s help in finding Elizabeth Wojdyla and Jaqueline Frances (or Francis) Cooper.” We believe they hold the key to unravelling the mystery. Both were allegedly terrorised by the Highgate Vampire, a supernatural entity said to haunt London’s Highgate district between 1967–1973 before being tracked to an abandoned mansion in Crouch End, then staked and cremated by self-proclaimed vampire hunter, Sean Manchester. Our appeal has been covered on various media, including Portals to the Truth, the Enfield Independent, Epping Forest, Waltham Forest, Chingford, Wanstead & Woodford Guardian, Hendon & Finchley, Barnet & Potters Bar, Edgware & Mill Hill Times, This Is Local London, Vampires.com, Vampirisme.com and featured in an episode of VBITE, a vlog hosted by Marita Crandle, proprietor of Boutique du Vampyre, New Orleans. We’re particularly proud of the appeal’s appearance in the Hampstead & Highgate Express, “home” of the Highgate Vampire legend, which published a condensed version of our joint press release in its letter column. If you’re a member of the press and wish to help our search, download our press release. For further information about the witnesses we’re searching for, read on. Elizabeth Wojdyla. Source: GrupoAlpha. Pencil sketch supplied by PhotoFunia. Shortly afterward, she began experiencing a series of nightmares, which resumed in 1969 after she had moved into a flatlet in the Highgate area in order to be with her then-boyfriend, Keith Maclean, who her parents disapproved of. Her brother noticed “two swellings on the side of her neck” one morning. Maclean convinced her to wear a cross at night-time and to fill her room with garlic. He bathed her marks with Holy Water and the nightmares stopped. In another account, Manchester proscribes the treatment Maclean gave her, and the associated events occur over several weeks instead of “several nights” in the original version. Manchester recalls their last meeting in 1981. She was living happily with someone else, “very much among the living and leading a normal existence.” During the live taping of Central Weekend‘s Sept. 14, 1990 episode, Manchester made a public appeal for Wojdyla to step forward to corroborate his version of events. “My request to the viewing audience for Elizabeth to come forward, however, met with no response”. Jacqueline “Lusia” Cooper. 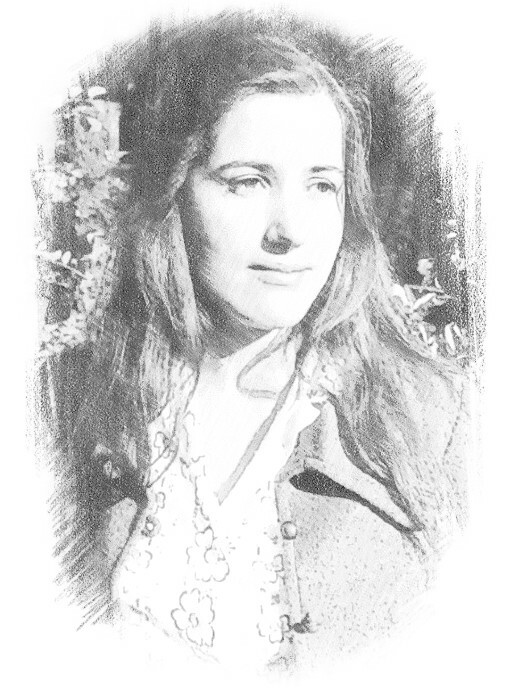 Pencil sketch supplied by PhotoFunia. The age of Jacqueline Frances (or Francis) Cooper, also known as “Jacqui Frances,” “Jacqueline Manchester” and “Lusia,” is harder to determine; a 1973 source calls her “a pretty 22-year-old blonde,” but another source, published two years later, says she was “a beautiful twenty-two-year-old woman” in 1970. This means she would either be 65 or 66, or 68 or 69 years-old today. She has a sister named Anne. While walking past the cemetery gates in an undisclosed year, she “saw this tall figure of a man with a deathly-white face staring at me from within the cemetery.” The figure approached her and when it dissolved, briefly, in the headlights of a sports car before reforming, she ran. A crucifix around her neck dislodged itself, she heard a hissing sound, and the figure vanished. In later accounts, Cooper (referred to as “Lusia”), is troubled by somnambulistic strolls to a certain tomb in Highgate Cemetery. She also had the tell-tale “two tiny pin-pricks” on her neck, participated in an unauthorised exorcism of the Wace vault in 1970 and participates in a necromantic ritual. Between the two witnesses, Cooper’s experience varies most. We’re confident she has an answer for the inconsistencies in her account. If you’re interested in speaking to Trystan Swale, he can be contacted through his website’s contact page and its associated Twitter account. If you’re interested in speaking to either of the administrators of Vamped, contact us through our contact page, Facebook page or Twitter account. Our hashtag is #findliz and #findjacqui. If you’re one of the witnesses we’re searching for, please note we will require identity verification, which we can discuss should you decide to reach out to us. 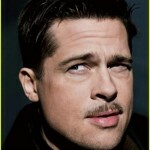 If he’s interested, we would also like to hear from Keith Maclean, Wojdyla’s ex-boyfriend and former Regional Area Secretary of the Vampire Research Society. Anyone personally affected by the Highgate Vampire, is also welcome to contact us. We look forward to hearing from you. tracked to an abandoned mansion in Crouch End, then staked and cremated by self-proclaimed vampire hunter, Sean Manchester: Sean Manchester, The Highgate Vampire: The Infernal World of the Undead Unearthed at London’s Famous Highgate Cemetery and Environs (London: British Occult Society, 1985). A revised edition was published by Gothic Press in 1991.
an episode of VBITE: “February 17, 2016,” YouTube video, 1:36, posted by marita crandle, Feb. 17, 2016, accessed Feb. 18, 2016, https://www.youtube.com/watch?v=S0etEBsgff8. 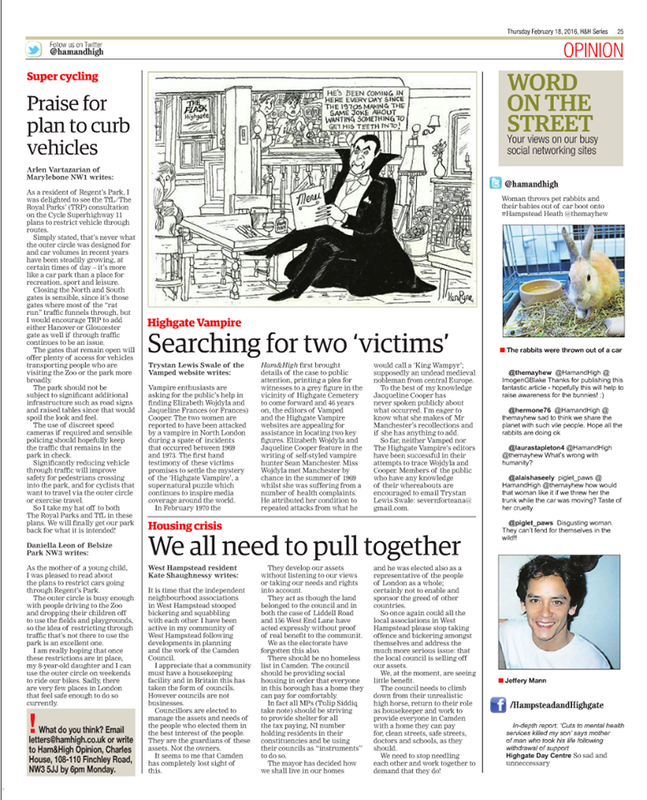 the appeal’s appearance in the Hampstead & Highgate Express: Trystan Lewis Swale, “Searching for Two ‘Victims’,” letter to the editor, Hampstead & Highgate Express, Feb. 18, 2016, 25.
download our press release: The Highgate Vampire and Vamped, Disappeared Victims of London Vampire, 2016, http://vamped.org/wp-content/uploads/2016/02/6februaryhvpressreleasecomplete-2.pdf. “Elisabeth Wodjdyla”: Sean Manchester, “The World of the Vampire,” Witchcraft 2, no. 8 (1973): 54. But this rendering of her name is most likely a misprint; her surname is spelled “Wojdyla” when repeated again in the same article and “Wojdyla” is the spelling used in subsequent accounts. Still, better safe than sorry. “of Southern Polish descent”: Sean Manchester, “The Highgate Vampire,” in The Vampire’s Bedside Companion: The Amazing World of Vampires in Fact and Fiction, ed. Peter Underwood (London: Leslie Frewin, 1975), 95.
her father was born in Krakow: Ibid. “dead bodies [. . .] emerging from their graves”: Manchester, “The Highgate Vampire,” 89.
she told Manchester in 1973: Quoted in Manchester, “The World of the Vampire,” 54. “two swellings on the side of her neck”: Ibid. In another account, Manchester proscribes the treatment Maclean gave her: Compare Manchester’s discussion of Elizabeth’s experiences in Manchester, “The World of the Vampire,” 54 with Manchester, “The Highgate Vampire,” 89–90, 94–102. “very much among the living and leading a normal existence”: Sean Manchester, The Highgate Vampire: The Infernal World of the Undead Unearthed at London’s Highgate Cemetery and Environs, rev. ed. (London: Gothic Press, 1991), 151. “My request to the viewing audience for Elizabeth to come forward, however, met with no response”: Ibid. “Jacqui Frances”: Manchester, “The World of the Vampire,” 53. “Jacqueline Manchester”: See certificate published in Don Ecker, “My Inquiry into the Highgate Vampire,” The Paracast, n.d., accessed Feb. 7, 2016, http://www.theparacast.com/darkmatters/borisdocument.pdf, . “Lusia”: Manchester began referring to her as Lusia in Manchester, “The Highgate Vampire,” 107, and continued in other accounts. Her true identity was revealed in Duncan Campbell, “Who’s Got a Stake in the Highgate Vampire?” City Limits, Jan. 17–23, 1986, 7. “a pretty 22-year-old blonde”: Manchester, “The World of the Vampire,” 53. “a beautiful twenty-two-year-old woman”: Manchester, “The Highgate Vampire,” 107. She has a sister named Anne: Manchester, The Highgate Vampire, 46. “saw this tall figure of a man with a deathly-white face”: Manchester, “The World of the Vampire,” 53–4. former Regional Area Secretary: Anthony Hogg, “The Church vs. the Undead, Pt. 1,” Did a Wampyr Walk in Highgate? (blog), July 22, 2010, accessed Feb. 27, 2016, http://dawwih.blogspot.com.au/2010/07/church-vs-undead-pt-1.html. archive.is link: http://archive.is/zTjc1. He was replaced by Robert Finch. Hello everyone, in 2014 i wanted to become a vampire from one man in UK and he collected my money, and he did not make me a Vampire. In 2015 someone directed me to a vampire lord in Bulgaria and this man make me a vampire. I will advice anyone who want to become a vampire should contact Wallace Graham via email: wallec_graham@outlook.com the money who make a Vampire.Miss Jennet.